Oops! Britney does it again! But this time she puts her mall-pop under the knife. The album marks young Britney’s attempt to let the light shine on her true self and get a bit raunchy and naughty. On the best cuts, ubiquitous mega-producers Neptunes and Rodney Jerkins help make the transition from teeny-pop idol to legitimate artist in style, by providing her with oomph, glitter and frenetic beats. Rest assured, Britney offers variety and a number of hits. For every funky grind and biting rhythm, there’s a healthy portion of ‘Oops…vibes’. If recent attire and suggestive quotes about reaching an older market weren’t enough then just check out the pulse soaring I’m A Slave 4 U, a well-calculated electrofunk. Swedish pop maestro Max Martin and his partner Rami make a wonderful team on the multi-layered Overprotected, as well as on the anthemic, Dido- penned ballad I’m Not A Girl, Not Yet A Woman. Britney’s co-written more songs than ever before, and these are strong selections here, whether it’s the hard-edged Lonely, the sweet That’s Where You Take Me, or especially the neo-disco Anticipating, one of the pure delights on this record. However there are far too many makeweight numbers like Cinderella, Bombastic Love, Let Me Be and Joan Lett’s cover version of I Love Rock n’ Roll. The songs that ring truest here are Anticipating and the R&B flavoured Lonely, which plays down the innocent girl predicament in favour of presumably more realistic scenarios. By far, this marks the journey of Britney Spears into a more mature sound that sees pop industry’s one of the biggest names pushing back musical boundaries and taking her career to the next level. This intelligently compiled selection of the finest recorded moments of godfathers of rock Iron Maiden has got to be something of an irresistible proposition. 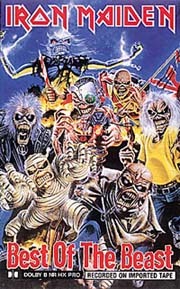 Best of the Beast covers all prominent tracks from every stage of Maiden’s illustrious career. This collection of 16 tracks, recorded between 1978 and 1996, can draw on 12 Top 10 albums — for those not caught up in the music’s thrall, it remains the most basic, if understandable, of pleasures. While the album contains many of Maiden’s best known songs — The Number Of The Beast, 2 Minutes To Midnight, Running Free (Live), The Trooper, Can I Play With Madness and Wasted Years— several prime cuts are left off in favour of the Blaze Bayley era. It’s incomprehensible that such rock-anthems like Wrathchild and Flight Of Icarus too could not find a place in this collection. The album also features the new song Virus, where Blaze Bayley does a great job on the vocals. From the early Paul-Di’Anno- fronted classics to Bruce Dickinson glory to the Blaze period, Best of the Beast stand as a monumental testament to the grandiose immensity of Steve Harris’ songwriting vision. A collector’s item indeed. 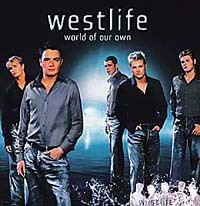 Probably one of the hottest boy bands around, Westlife comprising Bryan, Mark, Nicky, Kian and Shane has captured many music charts as well as hearts, since they burst into the pop scene in 1999. It’s hard to believe that a band that’s only been around for a handful of years has been awarded the Best Newcomers Smash Hit Award. Westlife is now making it big all over the globe. From their quadruple platinum album to holding a place in the Guinness World Records as the most successful new chart act of all time for achieving five consecutive number ones with their first five singles, to making history with Against All Odds (duet with Mariah Carey), the band has been making waves and yet craving for more. The boys are back with their third album A World Of Our Own, a catalogue of mix ballads, up-tempo dance tracks and great pop stompers. This is Westlife’s most accomplished album to date. Considering their two previous super-hit albums, such an achievement isn’t hard, but it’s the level of improvement that matters. And in this case the band has hit the bull’s eye. With its seventeen tracks, it features a selection of quality ballads such as Evergreen, I Wanna Grow Old With You, Wham-a-like I Cry and Don’t Let Me Go and more up-tempo numbers like the contagious Bop Bop Baby (co-written by Bryan and Shane), Love Crime and If Your Heart’s Not In It. The album also includes a stunning rendition of Sarah McLachlan’s Angel. Expect to get blown away by the stand-out tracks like the chart-topping World Of Our Own, Why Do I Love You and Drive. The headliner remains Queen Of My Heart (suspiciously reminiscent of Rod Stewart’s earlier works), which is a moving anthemic ballad showcasing the band’s vocal talent, produced by Steve Mac. An absolute banker for a top chart slot. Scott Stapp and company has unleashed its third studio album that majorly reflects grunge of the late 1980s and early 1990s. Just like on their last two albums My Own Prison and Human Clay, you will hear all the influences of the glory years of bands like Live, Stone Temple Pilots, Soundgarden, Alice In Chains and, of course, Pearl Jam. Listening through the initial tracks you may wonder what makes Creed the biggest selling band in the USA, but by the time you’ve reached the fifth track, you realise what makes the band click. 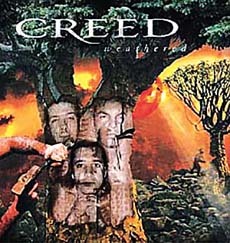 Creed’s moody guitar grunge and ardent lyrics, coupled with singer Scott Stapp’s passionate Vedder-esque vocals, has not only helped the band sell millions but also helped it establish a respected name in the world of rock. Weathered may not contain hits like Torn, One, My Own Prison, What’s This Life For and Higher, but the album is rife with evocative moodiness, much more darker, spiritual and experimental. The first single off of the album My Sacrifice has already captured major music charts across the globe. There is a hint of nu-metal on Bullets and Freedom Fighters. The effects-laden, passionate Signs contrasts nicely with the laid-back track Lullaby. Modern rock classicism at its most majestic. The newest group to jump on the rock/ rap bandwagon has already set standards for other bands to follow. This Los Angeles quintet uses two vocalists to capture the alternate spectrum. Mike Shinoda offers melody and rhythm through a percussive hip-hop delivery, while Chester Bennington provides angst and intense chants with his alt-rock roar. 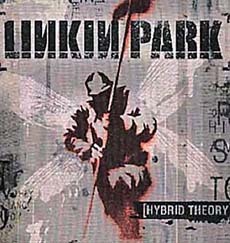 Linkin’ Park originally called itself Hybrid Theory and retained the phrase for the title of its debut album. Producer Don Gilmore (Pearl Jam, Lit) and twin threats serve up industrial-strength rap and rock melodicism with equal aplomb on this debut effort. Their first single One Step Closer dominated the charts and helped push the album to #16 on the Billboard Top 200. In The End and Pushing Me Away evoke a dark romanticism. Points Of Authority aims to sound like Trent Reznor (Nine Inch Nails). Songs such as Be Myself and Papercut are infused with enough melody to keep Linkin’ Park away from any comparison with 311, Korn or Slipknot. This has got to be the most deceptive album we have ever heard. One moment you sing it in the bath and the other moment you are head-banging to the limit. An entirely new level of hybrid. 1.Who produced George Harrison’s acclaimed Cloud Nine album? 2. Under what name did Simon and Garfunkel originally perform? 3. What was Sir-Mix-A-Lot’s debut album called? 4. Which movie of Frank Sinatra had a line that stated twice, "I don’t think these boots were made for walkin’"? It was made about two years after Nancy Sinatra’s hit These Boots Were Made For Walkin’. 5. Which member of REM played on a Smashing Pumpkins track on Siamese Dream? 6. Who appears on the cover of The Smiths’ album The Queen Is Dead? 7. What is the title of Hanson’s official magazine? 8. Who released the hit album Bleed Your Cedar in 1998? 9. Which band does Gavin Rossdale sing for? 10. What is the name of the movie that Bille Holiday starred in with Louis Armstrong?